3 PhonePe Airtel Offer – How To Get Free Rs.50 Recharge? PhonePe Airtel 100% Cashback Offer– Hi Guys, Hope You Are Enjoying the free recharge tricks. Here is Another Special Offer For Airtel Users. PhonePe is Giving 100% Cashback On Airtel Recharges. Read full post to know more about this offer. As You Guys Already Know That PhonePe Has Added The Airtel Operator. And Now You Can Recharge Your Airtel Prepaid Number From PhonePe App. To Celebrate This Partnership, they Providing The 100% Cashback Offer For All Airtel Users, Users Can Get Max Rs.50 Cashback Upto Rs.349 Recharges. Not Wasting Your Much Time , Read Below instructions To Get The Free Rs.50 Recharge. 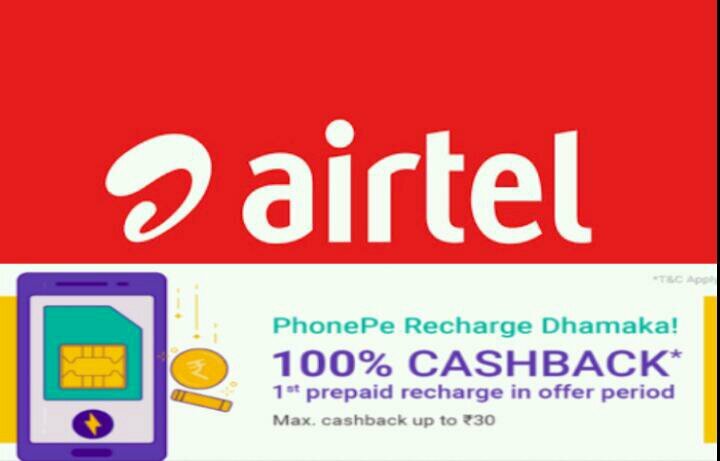 PhonePe Airtel Offer – How To Get Free Rs.50 Recharge? First Of All Just ⬇Download & install PhonePe App if You are New User. Now Just Open The App & Initiate The Recharge Of Rs.50 For Your Airtel Number To Get The Full Benefit Of this Offer (*100% Cashback Upto Rs.50*). Make Sure You haven’t Done Any Airtel Prepaid Recharge Till Now From PhonePe App. Now Pay The Amount Using Any Payment Mode , You can even Use The PhonPe Wallet Cashback Balance or using The UPI For Faster Transfer (*upi recommended*). Rs.50 Cashback Will be Reflect In Your Wallet Shortly. Enjoy The Free recharge offer. 100% Cashback upto a maximum cashback of ₹50 for transaction amount of upto ₹349. Flat ₹75/- cashback on transaction amount of ₹349 and higher. Offer applicable only on customer’s first Airtel prepaid recharge or first Airtel bill payment in the offer period. Offer can be availed only once per PhonePe registered customer in the offer period. This Offer Period 1st November, 2017 to 23:59 hrs on 10th November, 2017. The corresponding cashback will be credit into your PhonePe wallet within 24 hours of successful completion of the transaction. Cashback can be use for recharges, bill payments, merchant transactions across PhonePe. It cannot be withdrawn to any linked bank account or transferred to other users.